Herbicide application for weed control is an integral part of the method for chemical plant protection in agriculture. Herbicides are known to be used partially only for weed destruction (as to various assessments from 5 to 40 % of applied preparation amount) and the rest of their amount remains in an environment and due to high stability is not able to undergo quick physicochemical and biological degradation. Being a factor of man's impact on the environment, herbicides can play a role of toxicants under certain conditions, with manifestation of their effect on different organisation levels of living organisms. A comparative estimation of mutagenity for different commercial herbicide preparations was performed. Gesagard, granstar, zenkor, semerone, simazine and treflan were used for application on few plant test models such as Allium cepa L., Hordeum vulgare L. and Pisum sativum L. Crop seeds were germinated in water solutions of respective herbicide preparations. Seeds germinated in distilled water were used as the control. Concentration of the substances under test were chosen experimentally with due account of recommended doses, their solubility, as well as the influence on seed germination. It was established that simazine caused an increase in the number of chromosome aberrations. Gesagard, zenkor, semeron and treflan affected to some or other extent cytoskeleton structures and chromosome disjunction during mitosis. Cells with apoptotic characters were detected in plants seedlings treated with herbicides (see Figure 1). Cells of root meristem of Hordeum vulgare L. after treflan treatment (1 mg/l). 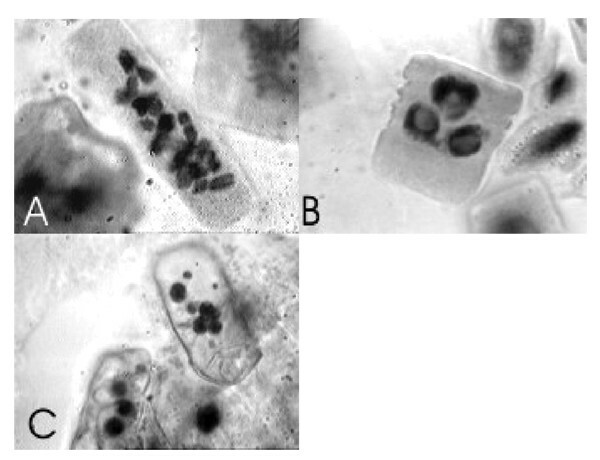 A. k-metaphase; B. three-nucleus interphase; C. apoptotic cells. Herbicides observed by us under pesticide effect indicate that cells undergo a state of oxidative stress. Active oxygen forms (AOFs) emerging under oxidative stress are known to affect the cytoskeleton structure . In their turn, disorders in the cytoskeleton result in a disorganisation of intracellular transport and oxygen consumption resulting in intracellular hyperoxia and the higher AOFs . Disorders in the stability of cytoskeleton proteins under oxidative stress cause inhibition of mitotic events and resulted in cell death. The cytogenetic effects of gesagard, zenkor, semeron, simazine and treflan were established. It was found that these herbicides are capable of destroying mitotic figures and delaying mitotic division which can result in plant cell death.